May 22, 2018 – A B-24 D-1 bomber, Heaven Can Wait, associated with 11 American servicemen missing in action from World War II was recently found and documented in Hansa Bay off Papua, New Guinea by Project Recover—a collaborative team of marine scientists, archaeologists, and volunteers who have combined efforts to locate aircraft associated with MIAs from WWII. The crew of “Heaven Can Wait” was part of the 320th squadron of the “Jolly Rogers” 90th Bombardment Group and was on a mission to bomb Japanese anti-aircraft batteries around Hansa Bay on March 11, 1944, when their B-24 was shot down by enemy fire causing it to crash into the ocean. The crew had arrived in Papua New Guinea just four months prior to join the Pacific theater of combat against the Japanese during WWII. Present-day Papua New Guinea was the site of military action in the Pacific from January 1942 to the end of the war in August 1945, with significant losses of aircraft and servicemen. 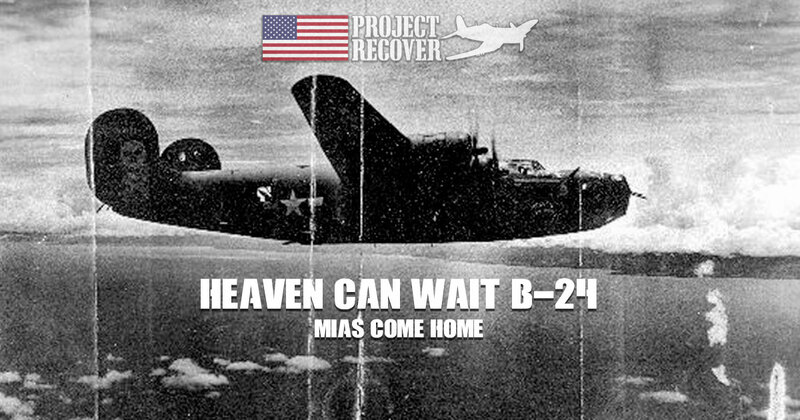 Project Recover set its sights on finding “Heaven Can Wait” after being presented with four years of research on circumstances of the crash, compiled by family members of one the B-24 crew members seeking closure for their lost relative. These data included historical eyewitness narratives from official military reports, mission documents, and diary entries from crew members on other aircraft information with the B-24 during its flight. In October 2017, a team from Project Recover set out to perform an archaeological survey of Hansa Bay believed to be the final resting place of 5 U.S. Aircraft with 24 MIA lost during fierce combat during WWII. Based on the historical data, “Heaven Can Wait” was believed to be offshore the north end of the Bay. After 11 days on the water, and a search that covered nearly 27 square kilometers of the seafloor involving scanning sonars, high definition imagers, advanced diving, and unmanned aerial and underwater robotic technologies, Project Recover located the debris field of the B-24 bomber, Heaven Can Wait, in 213 feet of water. The details of the crash site have been formally communicated to the U.S. government for their review to potentially set into motion a process for recovering and identifying the remains of up to 11 crew members missing for over 70 years. Project Recover: The Finding of ‘Heaven Can Wait’ B-24 from Kyle McBurnie on Vimeo. Project Recover’s cutting-edge team of scientists, historians, archaeologists, engineers, and divers conduct research and surveys to discover new crash sites, fully document wreckage and correlate wrecks to known MIA cases. That documentation can then be used by the U.S. Department of Defense’s Defense POW/MIA Accounting Agency (DPAA) to evaluate that site for the possible recovery of remains. DPAA is tasked with recovery and repatriation efforts, including notification of the families of these MIAs. The mission to Papua New Guinea occurred during Project Recover’s second year of formal operations and was made possible by a substantial financial commitment from Friedkin in 2016. Friedkin’s continued support is helping sustain ongoing missions, while enabling the organization to innovate its technology and broaden its search and discovery efforts to focus areas around the world. In the last five months there have been three repatriation ceremonies for American WWII service members who were recovered and identified as a result of Project Recover’s search and discovery efforts: Albert (“Bud”) Rybarczyk, Navy Reserve Aviation Radioman 2/c and Ora H. Sharninghouse Jr., Navy Reserve Aviation Ordnanceman 2/c of the U.S. Navy, USS Intrepid, Air Group 18 whose TBM Avenger went down in the Republic of Palau, and Navy Reserve Lt. William Q. Punnell whose F6F Hellcat was shot down in the Republic of Palau. To this day, there are still more than 72,000 U.S. service members unaccounted for from World War II, leaving families with unanswered questions about their loved ones. Project Recover intends on launching more underwater missions later this year in various locations within the Pacific and European Theaters. Project Recover is a public-private partnership to enlist 21st-century science and technology combined with in-depth archival and historical research in a quest to find the final underwater resting places of Americans missing in action since World War II. Established in 2012 with initial support from the Office of Naval Research and formalized in 2016 with private funding, Project Recover is a partnership among researchers at the University of Delaware’s College of Earth, Ocean, and Environment, Scripps Institution of Oceanography at the University of California San Diego, and The BentProp Project, Limited. Thank you for all you do to recover our MIA military personnel. Is Amami-O-Shima, just North of Okinawa out of your range? My father and 10 others went down in the sea in a B-17 Dixie Belle July 1946 while in the Army Air Corps of occupied Japan. I have the coordinates, accident report, etc and would help personally and financially if this is something you could do. My Uncle Marvin’s B24 went down on May 22, 1945. This is very important to a lot of families. Please keep up this work as long as you can. Thank you. Thank you for bringing home and searching for those men and women who gave their lives for our freedoms. Your work and dedication to this cause is greatly appreciated! I understand there are 2 planes names ‘Heaven Can Wait’…..
Hi Sandie, this is Julie Deason. We spoke a few years ago. My husband’s great uncle was William Atchley, assistant radio, on the Heaven Can Wait. I was so excited when I saw the news story about this plane! Was sad when the names didn’t match up, but so smart of you to ask for more detailed information. We still have hope of finding the plane! If you find out anything, we would love to hear about it!! So glad you posted here! My great-uncle was Harry O’Sean, the engineer. If you find any other information, I’d love to be informed. Great work! God bless your efforts to find these servicemen. Your actions help keep the concept of honor alive in these dark times. Thank you for your actions! I learned of the discovery of my 2nd Great Uncle John W. Emmer Jr. and “Heaven Can Wait” on the news in Minnesota last night. We are so grateful for the work you all have put into this and have made it a special Memorial Day for our family and all other families of the crew members on board. I did not know of John until about 1.5 years ago when I put together a family tree and realized he was killed in WWII. Once I discovered this I went to my grandfather, Tom Emmer Sr, with questions. It turns out John was my grandpa’s Godfather! Now having discovered his plane and remains it makes it a special Memorial Day for our entire family to reflect of his, and all crew members’, sacrifice. Thank you all and Happy Memorial Day! Thank you and another thank you for filming your searches. It helps connect faces to the special work you all do! Seconding Bobby’s words of thanks. I don’t know what to say but I am shedding tears as I am reading this newspaper article because my precious mother’s name is Mary Rebar Sheppick Chester, wife of Don’ Sheppick Navigator of the Heaven Can Wait Bomber (& mother of their son & my bother Donnie) who became his widow after his plane was shot down in the Ocean. My mom would travel everywhere in the USA where Don was stationed before his departure to the Pacific. I have so many memories of stories about Don & her as I asked her to tell me everything as we paged through their scrapbook & photo albums. He became so real through my mom’s many reflections that she shared with me through his many letters and poetry he had written for her (as only a wife could). I hope that the Purple Heart, scrapbook & photos & personal things that we still treasure of Don’s will be cherished by future members of the family. Thank you so much for posting this article.This means so much to me as I am probably the one who knows so much about Don through all my mother’s stories & tears. Simply incredible! —Cindy Chester Moran. Thank You so much! MY husband was named after his Uncle Eugene Darrigan. We found this to be so interesting! Sincerely,Eugene and Judy Tompkins. Hello,I have a brother that was killed off the coast of Cal.,in the San Diego area in World War 2. It was a collison of two aircraft while on a training Mission flying off the USS Makin. Do you have any information on this? I have more info on this if you are interested +eye witness accounts. Would like to find more about this if possible. Larry Bostic, brother of Lenard Sherman US Nayy pilot. What unit was this aircraft from? The unit for the aircraft is listed as 5 AF in our records. My great Uncle Marvin Lytle was with the 413th squadron that went down on a plane March 22, 1944 somewhere in the Rabaul target area. Thank you so much for the efforts you are putting forth to find these lost heros!! I learned about Project Recover for the first time in this article. For me, the most shocking part of the story was the reference to 72,000 still missing service members from WWII! What has our government been doing about it since 1945? What is the degree of on-going effort to resolve as many MIA’s as possible? And why, like I’m sure many others, have I not heard anything about this – and I’m 80 years old? I am so thankful for the efforts of Project Recover and their successes. But this should be an ongoing public aware effort without resting, with massive funding, and calling upon all the resources necessary nationally and in the international community. We should be ashamed the 72,000 missing are not a national effort in the forefront of our national conscience. What a great mission,Memorial Day was extra special this year because of the reporting.Thank you for this work you are doing.in bringing closure to the loved ones of these men. My father also went down in a B-24 on Nov.11, 1944. His plane went down in the Adriatic Sea. His name was Lt. Milton D. Bellis, He was the bombadeer. He and all but one crew member were lost.I have his records that pinpoint the point of impact. Please advise me. First Lieutenant Lawrence D. Cragen, USMC, was one of the crewmembers of a Marine EA-6B Marine aircraft that crashed aboard the USS Nimitz on the night of May 26, 1981 off the coast of Florida near Jacksonville. All three crewmembers were killed. The body of LT Cragen was ejected into the Atlantic when the fire cooked off the rocket in his ejection seat. His body was never recovered. LT Cragen worked for me in the admin dept of our squadron VMAQ-2 when we were not flying missions. The exact location of the ship when the accident happened and its track afterward in the following hours should be on record somewhere. Back on 4 Dec 1961, my father, Navy pilot Thomas Gerald Rose, Jr. lost his life while doing landings and take-offs at Point Mugu, off the coast of CA. His plane and his remains were never recovered. I realize this wasnt part of WWII, but if you ever do searches for post WWII, I would be ever so grateful for your assistance in finding his plane. On February 28, 1944, three B-24 bombers went out in stormy weather, heavy rain and icy condintions on a mission out of Nabzab Strip #1 on a bombing mission to Hollandia, New Guinea. Because of the weather, two of the planes turned back. In bad weather and heavy undercast near the target, the last words from Merritt’s plane (crew of 10 men) was, “Target located. Dropping bombs.” The unit headquarter expressed the opinion that the adverse weather conditions probably caused a crash or forced landing somewhere between the plane’s base and their destination. Family members always hold out hope that our loved ones will be found. It is always tough having no closure. I am writing this as a neice that mourns an uncle she never met. This is wonderful honorable work that you are doing. Thank you. Are you, or other organizations, also looking for the submarines that were lost and are as yet unfound in the Pacific. As far as I can find out, my uncle and his crew-mates aboard the U.S.S. Trigger are still on eternal patrol. Blessings to you in your continued good works. Thank you for what you do, our family has always had questions about our uncle John M. Laster. Their plane went down near Wewak area of Papua New Guinea. March 8th of 1944 name of the plane was Sunshine I serial number 42-41225 if there is any other information it would be very helpful thank you. This is very moving and enlightening. The process and recovery has been very respectful. Are you please able to disclose the precise size and range of the debris field. This relates to work being undertaken on a UK site at the moment. Any assistance you could offer would be wonderful. Hi I’m am looking for my sisters father any infamation would be grateful his name is John Dewitt-Johnstone a parry trooper in USA forces my sister is still livin aged 73 in Cairns North Queensland Australia. John left for Papua new Guniey wwll 1943.thanks for your ongoing effort. My mothers first husband Robert Suhl was a crewmember of a plane that was shot down over the pacific in world war 2 and i would like to know howbi go about finding out if the plane he served on was one of the ones that have been discovered. My mother has passed but i still have a notebook of drawings that he made that she cut out of letters he sent her and there is a memorial to him on my parents gravesite. Someone from Project Recover will email you soon. My father, Jack M. Berkovitz, was part of the 90th Bombardment Group, 320th Squadron. He was awarded the Air Medal for a mission at Hansa Bay on April 12, 1943. I can only wonder if he knew the crew of Heaven Can Wait and perhaps was their squadron leader for some missions. I would appreciate hearing from anyone who might have more information about my father. Also, if the families of Heaven Can Wait plan a memorial for their lost love ones I would like to send a wreath or flowers on behalf of my father, to honor those who were lost. Please advise.